The 1st and 2nd floors have been created into Scratch, a modern smooth stylish nightclub bringing a new dimension to clubbing in belfast open wednesday to sunday night from 9pm til late. The club upstairs is called Scratch. Have you got Google Earth on your computer? If so, then download the Google Earth view of The Fly. Is this the wrong position for The Fly? If you think so, then modify its position. Click / Tap the button above to get directions from where you are to The Fly. went to scratch last night for my 21st bday had a gd nite music was gd they dnt play the same song twice which is a brilliant thing wasn't busy at all but i hada good night. and bring my friends.would let them see what nightlife is like in Belfast. By the way enjoyed the grub. Was in scratch just before christmas on a works do - what happened???? The place was full of undesirables, i don't pretend to be a metrosexual or otherwise but these people were proper scum. The decor is getting dated and could do with a renewal, cleanliness and standards ain't great. Finally.... door staff were muppets. small fat guy with black hair and an attitude on the door - you're clearly not capable of doing your job based on whats inside so why the attitude? When i think back there were a group of guys worked there for years, spoke to you every time you arrived and kept a good crowd in the bar..... where are you now???? Went to scratch for a hen night (we were over from glasgow), management were great with free cocktails etc but night ended on a low with the bride to be's hand bag being stolen. Good music and atmosphere (guys are a bit too forward) but would keep belongings and drinks close!! This is the place to be on a monday night i love it!! This place must have drastically changed since the majority of these reviews were written. On several recent occasions i have found SCRATCH to be a great venue for a night out. The doorstaff have been friendly and professional and the dancefloor, as i remarked to friends, was completely devoid of ice/glass/spilt drinks. Some problems still exist in the form of inept barstaff and crowd numbers however the barstaff will improve with time and why go clubbing if you want to be alone? the door staff are well out of line wit ppl, then when you get into the club the staff at the door could do wit smlie. the wait at the bar is way to long. the music is good but i don`t think i would tel any1 about it, but sure thats wat i think other ppl can find out 4 them self. 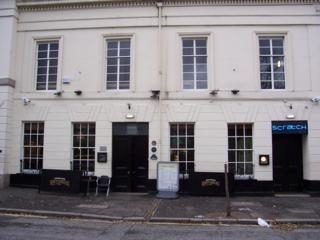 went a few saturday nights ago for the first time and was very very annoyed i did, first off the doorstaff were rude and overly fussy with dress code considering that when we got in other punters were wearing exactly what they were knocking others back for outside, next off very bad service at the bar, either the staff are new or rubbish as i stood for 30 minutes for a drink in a quiet enough bar. music was crap downstairs and this "Bald DJ" was nasty to one of the girls in the group when she asked for a request, whats that all about? We went upstairs and it was more of the same crap service and the place is tiny. Some "manager" i assumed with spikey hair thought it more entertaining to mess about with the staff rather than serve us. As for the music "planet love Anyone" if that is PK of cool Fm you can guess who i won't be listening to again. we stayed for about half an hour and decided to go elsewhere. Do yourself a favour and don't waste your night on this dump. SCRATCH is right, cause you'll feel like you have to by the time you get out!! Especially if you have the misfortune of having to use the ladies!!!! The place is a dump, unless you'd like to experience life as a sardine. To be avoided at all costs! Very poor club with awful door staff. DO NOT GO IF YOU ARNT WEARING A SHIRT BECAUSE TSHIRTS JUST ARNT GOOD ENOUGH SO THE MANAGEMENT SAY. who was the photographer in there last nite (6-6-08)? class club!! a big step forward compared to the old fly!! i liked the age group, no teenies!! friday night was cool not jam packed and pretty easy to get served at the bar! Great place to go for a few drinks. I preferred the way it was done up before but the new style is growing on me. Have to disagree with people who say the bar staff are useless, I found they were more than helpful and the cocktails we tasted were delicious! Keep up the good work! But if you wanted to be treated badly this is the place to go. PK the DJ very good tho! At 28 years old, i felt old and out of place... the place was "SWARMING" (excuse the pun!!) with 18 year old "wigga's"... all being cool while listening to Jay Z and Akon. Not my cup'o tea! I was forced to endure a whole night in there due to friends not being bothered to find a new spot (seeing as we'd SOMEHOW got seats) Even so, i spent the entire night in the bar que.. once served, i'd LITERALLY re-join the que.. and id STILL be out of drink before getting served again! Toilets: If you could get in there?? not bad. Note: Charged to get in too for the privalidge of all the above. This is a Review of the New Fly - Tap House or whatever you call it! Absolutly terrible! Nothing has changed, still let in far too many people and to charge a £5 in for that on a saturday night is a disgrace! 2 people at the top bar serving who where so slow it was unbelievable! Waited 30 min to get a drink the first time, was waiting about the same length again and couldnt get a drink anywhere in the place! Far too busy! Full of pretentious woman sipping cocktails who thought they where something special! Avoid this place like the plague, absolutly awful! Ill not be back! Went there with my best friend. A bouncer with an ear ring decided to play the hard lad by not letting me back up to were I was after returning from the bathroom. He was very rude, despite telling him that my friends are up there. The bouncer was very, very rude. I guess decent people can't be allowed to have fun in his eyes. I will not be back there and really hope they get better bouncers who actually give a damn about those punters in those nightclubs, because it is the people who come from their homes and spend at least 40 to 80 pounds on drink and have a good time. It pays their wages, keeps them a job and puts food in their mouths. People who act like that makes the bussiness look very bad. I go out to have a good time not to be treated with the most disrespect. I'd advise people to advoid this place. The place is too small, it should really be re-designed. The floors are sticky and the toliets are more like it was still under construction and really needs to have the pipes checked. Really, that would put them out of bussiness if the heath and safty people walked in. How they can justify charging ?3.00 admission on a Saturday night beats me. Most of the other bars in the City Centre have djs and are free entry. No wonder the downstairs bar was practically empty on the night we went.